Dry. Prairies, open woods. Full sun to partial shade. Rocky or sandy soil. This is a 20″ to 32″ tall, erect, perennial forb that rises on a group of basal leaves and 1 to 8 stems from fibrous roots. The roots are borne in 2 to 8 spreading bundles (fascicles) that may stretch more or less horizontally up to 32″. They are sometimes stout but they are not tuber-like. The plant does not have a taproot and does not spread by underground stems (rhizomes). A radiating group of 5 to 12 basal leaves forms a rosette rising from the root crown. Basal leaves are rounded to pentagonal in outline, up to 3″ long, and up to 4¼″ wide. They are on slender, up to 5½″ long leaf stalks (petioles). They are deeply palmately divided into 5 to 7 segments. Each segment is further divided into 3 to 29 ultimate lobes. The ultimate lobes are linear to narrowly inversely egg-shaped and 1 ⁄16″ to ⅜″ wide. They may be broadly angled to sharply pointed at the tip, or rounded at the tip with a minute, abrupt, sharp point. The upper and lower surfaces are covered with short, fine, grayish or whitish hairs making them velvety to the touch. The margins are untoothed. Basal leaves wither early but some are present at flowering time. There are 4 to 12 alternate stem leaves above the basal rosette. Stem leaves are smaller, with fewer, narrower ultimate lobes and shorter petioles, but are otherwise similar to basal leaves. 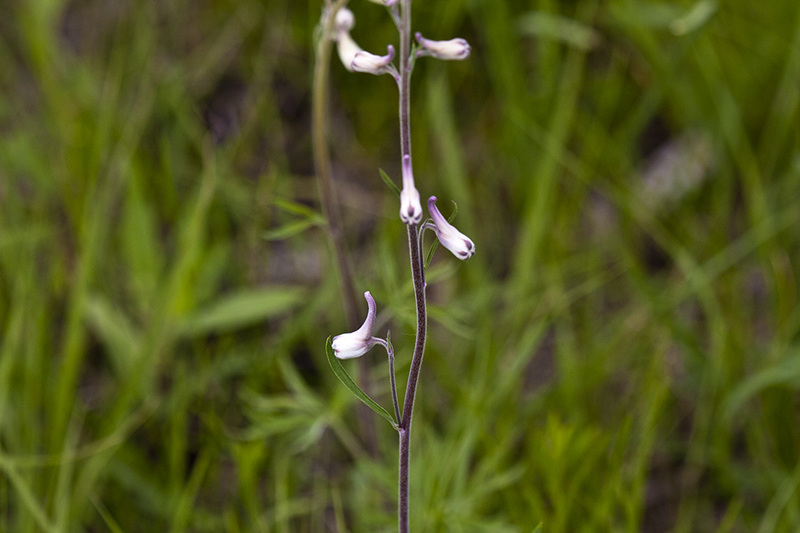 They become smaller, less divided, and have shorter petioles as they ascend the stem. Mid-stem leaves have 5 to 15 ultimate lobes, each 1 ⁄32″ to ¼″ wide. Petioles of upper stem leaves are ¼″ to ½″ long. The stems are erect, greenish-white, and round. They are unbranched or sparsely branched just below the inflorescence. They are moderately to densely covered with short, whitish hairs. The inflorescence is a narrow, elongated cluster of 8 to 27 flowers at the end of the central stem, and occasionally 1 or 2 shorter clusters. 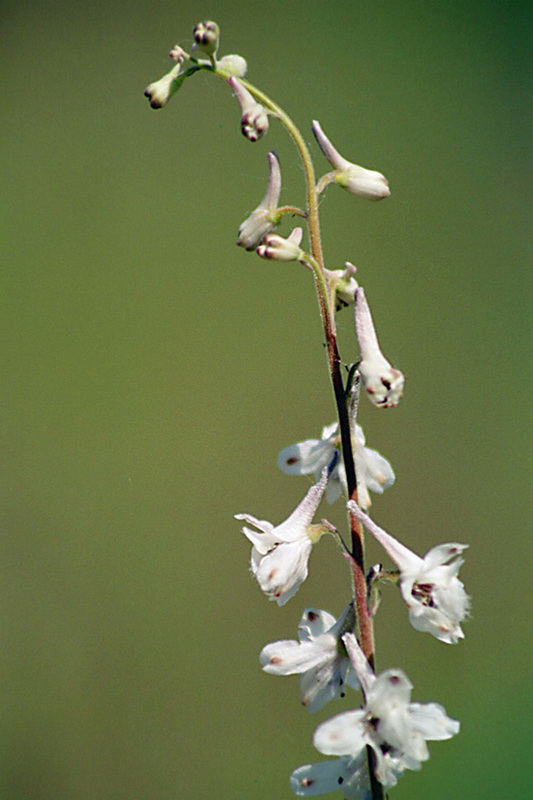 The cluster is usually unbranched, like a raceme, but is sometimes branched, and is therefore technically a panicle. The axis is moderately to densely covered with short, curled hairs. Individual flowers are on erect flower stalks (pedicels) that appear appressed to the axis, at least in the lower half of the inflorescence. The lowermost pedicels are ½″ to 15 ⁄16″long. Each pedicel is subtended by a single, undivided, linear, ⅛″ to ¼″ long, ascending, modified leaf (bract). The bract subtending the lowermost pedicel is sometimes 3-lobed. 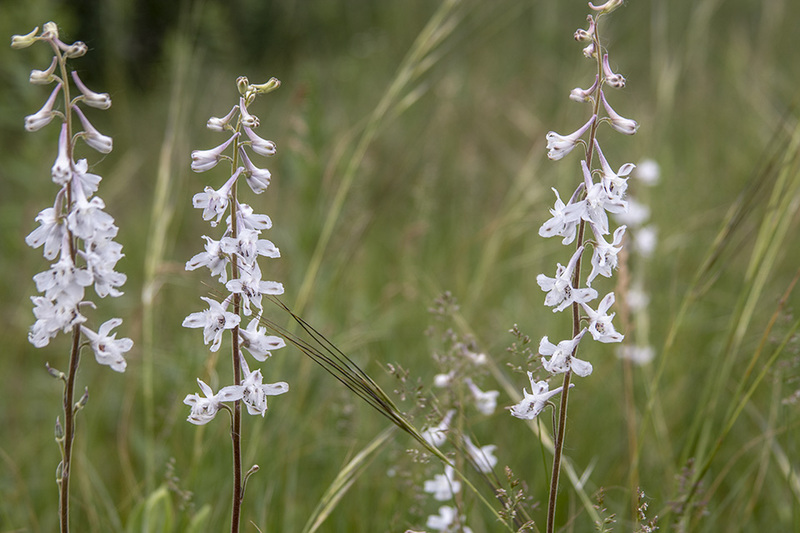 Each flower is irregularly shaped, about 1″ long, and about ⅝″wide. There are 5 sepals, 4 petals, 25 to 40 stamens, and usually 3, sometimes 4 or 5, pistils. 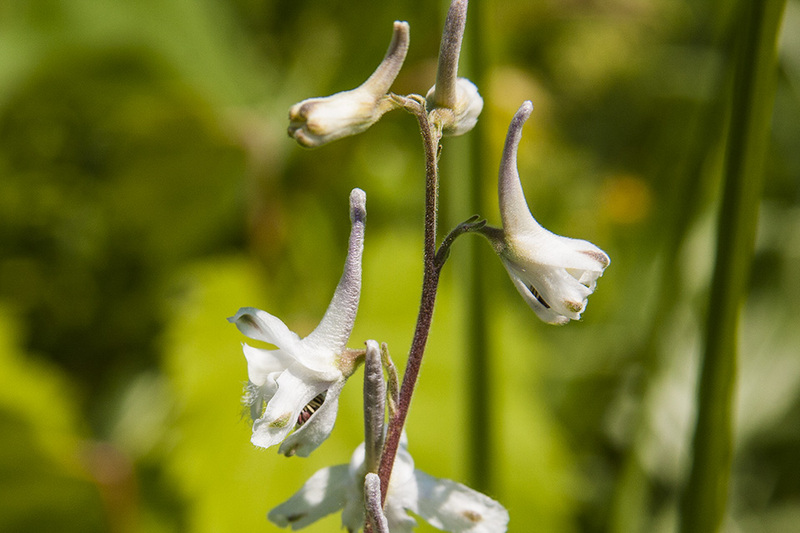 The sepals are petal-like, white or greenish white to pale blue, ⅜″ to 9 ⁄16″ long, and ⅛″ to ¼″ wide. The lateral four sepals are spreading, ⅜″ to 9 ⁄16″ long, and ⅛″ to ¼″ wide. There is a small green or purple patch near the tip of each sepal. The upper sepal is similar but extended backward into a narrow, tube-like appendage (spur). The spur is ⅜″ to 9 ⁄16″ long, ⅛″ to ¼″ wide, and slightly curved upward. The petals are ⅛″ to ¼″ long, free (not fused together), and white, sometimes tinged with blue or yellow. They protrude from the center of the group of sepals. The lower 2 petals are lobed for about half their length and bearded. They more or less cover the stamens. The stamens have yellow to brown anthers on 3 ⁄16″ to ¼″ long filaments. They are not showy. The fruit is a dry, more or less cylinder-shaped, slightly curved, ½″ to ¾″ long seed pod (follicle) with numerous seeds. It has a 1 ⁄32″ to ⅛″ long prolonged tip (beak) and may be covered with fine, short hairs or hairless. They occur in erect clusters of three joined together at the base. The seeds are yellowish-brown or brown to almost black. They appear scaly due to a dense covering of tall, thin, undulating ridges. This is the only Delphinium in Minnesota. There are no similar species. There are four subspecies of Delphinium carolinianum. This is the only subspecies found in Minnesota. Plants in the genus Delphinium are rich in the alkaloid delphinine, which is toxic to livestock. Deer generally avoid them. Bearing one or more tufts of hairs. A small bundle or cluster, often sheathed at the base, as with pine needles. A dry fruit formed from a single carpel, containing many seeds, that opens at maturity along the seed-bearing seam. A radiating group or cluster of leaves usually on or close to the ground. On flowers: a hollow tubular appendage, often containing nectar, formed from a sepal or petal. On branches: a short shoot bearing leaves or flowers and fruit. 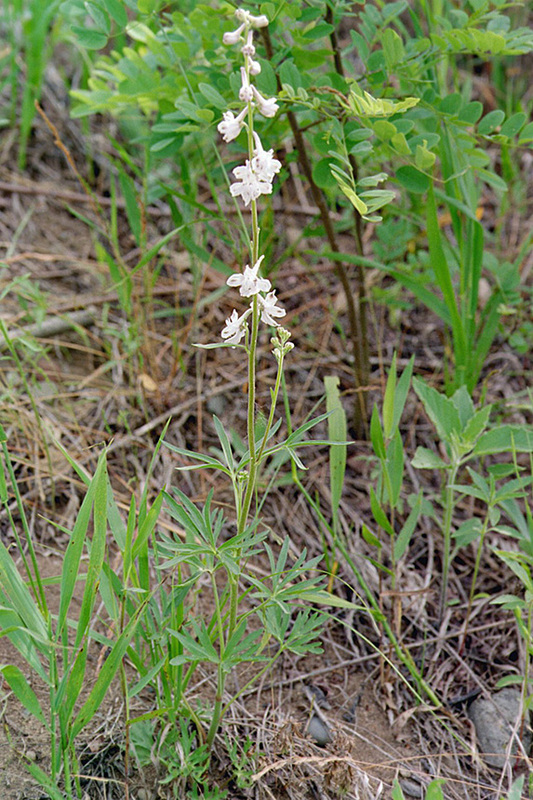 Summary of the effects and how to identify Prairie Larkspur. 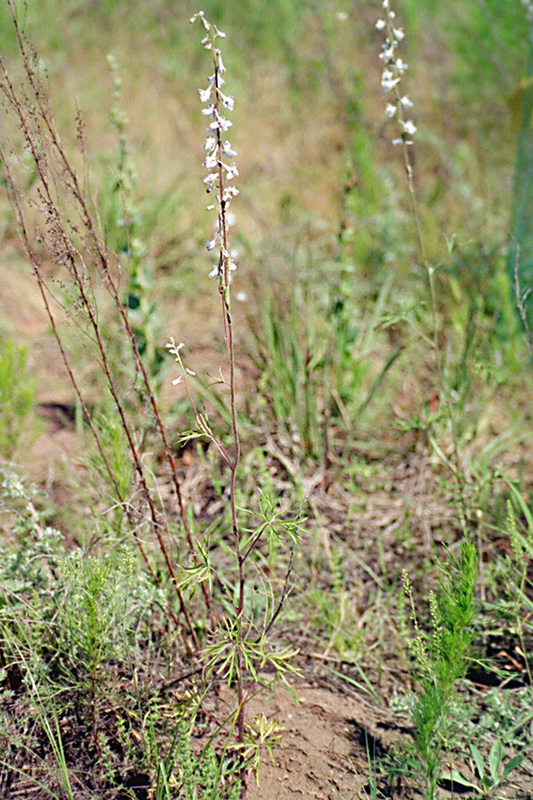 Michael Fisher, Area Extension Livestock Agent in Colorado discusses the effects and identification of prairie larkspur.